Aéroports de Montréal recently rehabilitated the primary runway at Montreal-Mirabel International (YMX), one of the three largest aeronautical centers in the world and a major hub for Quebec's economy that serves 24 cargo airlines and a host of corporate and military tenants. Of late, YMX's aeronautics and industrial park has reached a critical mass regarding industry-related activities such as aircraft assembly; aircraft component manufacturing; aircraft and component maintenance; and training and research/development operations. In fact, fully 80% of the approximate 4,000 jobs within the park are linked to the aerospace industry. At nearly 3,660 meters (roughly 12,000 feet), the airport's primary runway had more than enough length for all types of cargo and tenant traffic; but time had invariably taken its toll. Built in the early 1970s, Runway 06-24-the second longest in Canada-was simply due for a facelift, explains YMX engineer Elie Elhindy. "We regularly do maintenance inspections and we had come to the decision of completely rebuilding the runway," Elhindy elaborates. "In 2013, the runway showed a very low pavement condition index (PCI). To ensure safe operations, and meet requirements, it needed a major rehabilitation." Given the subsequent project's scope-complete rehabilitation of paved surfaces as well as drainage and electrical infrastructure-many within the industry will be surprised by its $57 million price tag (approximately $43 million U.S. dollars), notes Elhindy. "The average cost to rehabilitate a runway with CAT II approach this big would be approximately $95 million U.S. dollars," he explains. The airport faced a very tight time schedule for getting the project done, Elhindy relates. With this constraint in mind, airport management worked closely with contractors and consultants beginning in 2014 to evaluate the existing pavement conditions in order to come up with efficient and cost-effective design alternatives. Aéroports de Montréal hired Stantec to serve as the civil engineering consultant responsible for preparatory studies and tender documents; Englobe to provide geotechnical laboratory services and quality control; and SNC-Lavalin for electrical engineering work. After thoroughly analyzing the condition of the existing runway and studying various rehabilitation solutions, Aéroports de Montréal engineer Elhindy finalized the design, which is based on a hybrid rehabilitation concept. The selected design met several key criteria, including a lifespan of 40 years, a limited budget and limited time for construction, he explains. The design is also based on past experience, particularly the 2004 rehabilitation of Runway 06R-24L at Montréal-Pierre-Elliott-Trudeau International, also designed by Elhindy. Moez Gmach, project manager and design leader for Stantec, notes that cost and schedule considerations made it infeasible to consider complete demolition of the runway. "To determine the best approach, the runway's current condition first had to be diagnosed," he explains. "Based on geotechnical studies and surveys using laser remote sensing, a detailed portrait of the runway was created." Overall, crews inspected 8,120 concrete slabs to record and analyze defects. Based on these evaluations, the final hybrid rehabilitation design divided the runway into several zones, and each received a different approach in terms of concrete strength and slab dimensions. The thresholds underwent complete reconstruction due to poor results of core samples. A rigid pavement overlay was confined to the center portions of the runway, with replacement of shattered slabs and stitching of longitudinal cracks. Rapid exit taxiways B6, B5 and B4 received asphalt overlays on existing pavement. 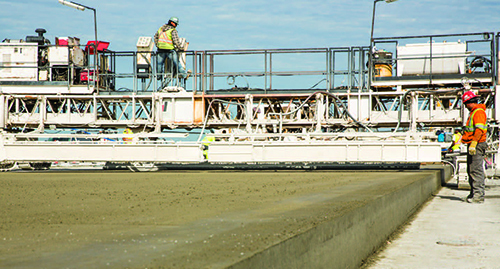 This hybrid approach, with varied concrete strength for different zones, and the recycling of the old concrete kept costs to a fraction of the amount required for typical rehabilitation of a comparable runway, Elhindy emphasizes. The strategy also made it possible to restrict complete demolition and reconstruction to specific portions of the runway. Preparatory work for the project began in October 2015. Because YMX has only two runways, keeping secondary Runway 11-29 operational throughout the yearlong construction project was critical. To do so, the airport installed Instrument Landing Systems on 11-29 and transferred one of the arresting cables for F-18 aircraft from Runway 06-24. The runway and taxiways were isolated and secured with fencing according to Transport Canada security standards, and contractors constructed an access road to provide easy access to the worksite for crews and equipment. They also built an onsite concrete batch plant to expedite work, and construction began Dec. 1, 2015. The runway thresholds were demolished and completely rebuilt because of their pronounced degradation. Complicating matters, the aircraft arresting system used by the military had to remain in place. "The slightest change in levels on either side of the arresting cables would have automatically resulted in the complete reconstruction of this complex system," Gmach emphasizes. "This would have hampered the project by creating complications and delays." Crews used recycled materials from the demolition of the thresholds to enhance the runway edges. And the central portion of the runway was raised after repairing damaged sites. New 7.6-by-6.1 meter concrete slabs were laid over stable existing slabs. The new joints were carefully aligned with existing joints to control movement of the concrete slabs and reduce the risk of cracks. A special geotextile membrane studied in the laboratory by Englobe was applied between the new and old slabs to allow them to move independently. While innovative, this hybrid approach presented many technical challenges, Gmach reflects. "Design parameters had to ensure an adequate transition between the different levels of the runway areas," he explains. "The optimal geometric elements for these transition zones had to be identified according to applicable standards. Moreover, given the projected traffic and the wide temperature differences of the region, it was also necessary to ensure that the structures of each zone behaved in a uniform manner in the short-, medium- and long-term so as not to create unevenness in the pavement surface." 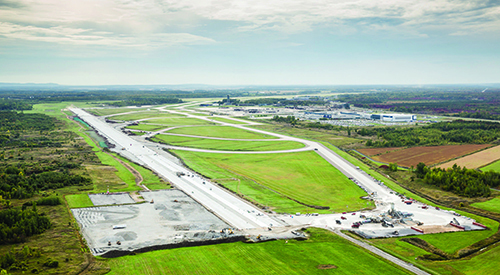 The tight construction schedule and cost considerations prompted Aéroports de Montréal to bring electrical engineering consultant SNC-Lavalin into the project planning phase in early 2014. Gabriel Theriault, an electrical engineer with the firm, notes that YMX leveraged its competencies and experience prior to the design phase. "The airport wanted us to study the whole project before entering into the details of the design phase," Theriault relates. "We studied the project for a full year, which helped us to make significant decisions using the latest construction methods and technologies." For example, the airport decided against using manholes, which can be hazardous and require two people to enter with harnesses and gas protection equipment to pull and run cable. Instead, it opted for the can plaza method, whereby crews pull and install cable from a number of smaller hand holes. Electrical work had to be closely coordinated with the paving contractors, because both were occurring at the same time. "During the design phase, we had to consider carefully how to coordinate electrical and runway construction activities," comments Theriault. "Communication was critical. At every step along the way, we had a person on the field to verify that installations were correct." Crews replaced the runway's entire incandescent and halogen lighting system with LED lighting. More than 800 airfield lights and approximately 160,000 meters of cable were installed. Improvements to the storm drainage system spanned all pavement grates. Workers replaced five type-D manholes, and adjusted and/or raised 90 type-B, -D and -F manholes in the concrete overlay sections. Approximately 2,000 meters of drainage ditches were profiled, 1,300 meters of ditches cleaned and 2,000 meters of drainage pipe replaced. 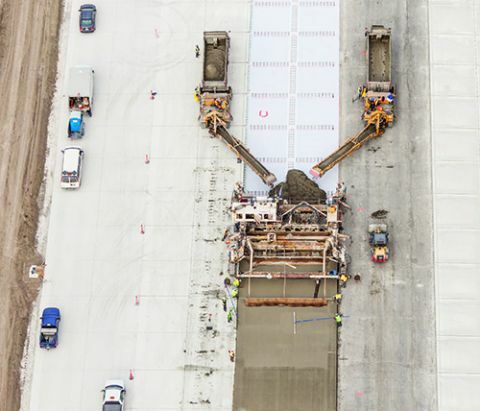 All told, crews poured approximately 122,000 cubic meters of concrete and laid 22,000 tons of asphalt within a six-month time frame, informs Jean-François Coté, director of projects for general contractor Demix Construction. "It was the largest concrete project ever performed in Quebec Province," he comments, adding that the firm recycled all concrete and asphalt demolition materials. "No materials were sent to an external dumpsite." In order to facilitate the redistribution of 60,000 cubic meters of demolished concrete (the equivalent of 16 Olympic-size swimming pools), the contractor installed a crushing facility onsite. A portion of the aggregates was used to upgrade the access roads during construction. The remaining material was used to raise the terrain along the runway, taxiway and service road edges. The materials were confined within a protective geotextile membrane to prevent toxic infiltration into the environment. In looking back on the project, Elhindy believes that although the challenges were significant, the rewards are considerable. "The cold weather was especially challenging," he reflects. "The summers are short here, and we had to lay a lot of concrete in a short period of time. But we got the runway open in November 2016-on time and within budget."